I am over at my sister's today keeping Nathaniel. I could tell he was a little sleepy over lunch. His mother called to check in. She was giving me the naptime ritual of books, sippy cups, rocking, songs, and the all but standing on my head I would have to do to get this punkin to sleep. When I hung up the phone I discovered this. Sweet! (And yes, I was giving his hair a little trim at the table). The camera was right there so it's not like I made him suffer! I scooped him right up and tucked him effortlessly in bed. I think I might join him. Oh, but my sister has homegrown tomatoes and white wheat bread and Romain lettuce and Diet Rite. I like coming here because they always have a fully stocked pantry and refrigerator. Natty is out for at least an hour, maybe two. This having a baby stuff is a piece of cake! Oh, I wonder if they have cake? 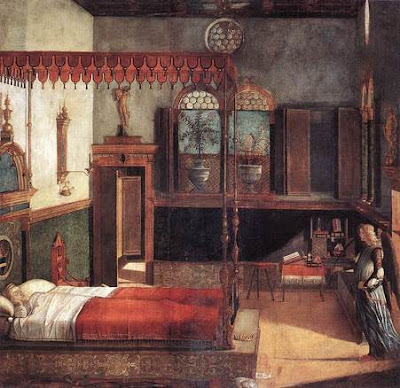 "Pay attention to your dreams: when you go on a trip, in your dreams you will still be home. Then after you've come home you'll dream of where you were. It's a kind of jet lag of the consciousness". - Barbara Kingsolver, "Animal Dreams"
I love Barbara Kingsolver. Her book "The Poisonwood Bible" is one of my all time favorite books ever. I am reading "Animal Dreams" right now. I have only read one other of her books and although good, it was not as amazing as "Poisonwood", but I found a used paperback version of "Animal Dreams" for $1.50 at the Nearly New shop and thought I would read her for inspiration. The woman can write. I found this quote in the first chapter. How true is this? I am there. While in Mozambique last month, I have to admit I dreamed of home. I am home now, and wouldn't you know, I find myself wondering just what is going on over there. I still see their faces. I haven't talked much about the devastation that is there, a nation wrecked by civil war and famine. I didn't take photos of the extremely malnurished. I would never want to exploit the poor. But they are there, constantly in the back of my mind. I think about the little handicapped girl with the huge grin. She was about 13 and crawled along the floor, her left arm tied around her neck with a string. Or the little boy who stood so straight and tall and told us he was orphaned because his mother has leprosy and she lives with other lepers in Pemba. I didn't tell you about seeing a leper get healed either, but he did! I saw a lot. I have a lot to process. I don't ever want to forget them. I want to fight for them. I don't want to just dream of them. I want to bring them life. This trip was a little different from the last in that I was actually looking forward to coming home and have enjoyed every minute of being home. The last time, coming home was painful and I didn't enjoy being back home. Western life and all our waste and shallow focus on everything grieved me and I was not happy. This time, I embraced coming home and am grateful for all things. But I don't want their faces to ever leave me. I want to dream of them always. I want to dream with them. Specifically, I want to do research on self-sustainable village models. I know there have to be solutions out there, even in my dreams! Carla and Kevin dropped off Carson and Catherine on their way to the airport Friday. Carson turns 6 on September 4th, so we loaded up in the car, not wasting any time on starting the celebration a little early, and went on "Destination Unknown"! Carson tried to play "20 Questions" to guess where we were going. He kept asking "Is it the reason we brought our bathing suits"?, which just made me laugh, because I didn't know they were bringing bathing suits. They obviously could not guess it and when we arrived they wanted to know just what this place was all about and it got dubbed "The Birthday Store". I think Richard's used to be kinda a Hardware/Trinkets from China store in the Peachtree Battle shopping center. The trinkets got a little more fancy and the Toy Department went from a few Brio train sets, ordered by demand of the Buckhead mom's needing a birthday present, to a now extensive stock of Brio, Lego, Doll Houses, Puppets and much more. I go in there for that hardware item you just don't want to brave Atlanta-based Home Depot to get. The girlie "hardware" items that I need are stuff like plate hangers and Velcro and Mod Podge, all can easily be found here. It is much more fun to go here than that awful concrete-floored Home Depot. I loathe that place. This place has toys and games and funny birthday cards and gag gifts and trick gum and googlie eyed glasses and cheap silk slippers made in China. They also have a mechanical pony that you can ride for .25 cents. Okay, maybe YOU can't ride it and I certainly can't (50lbs or less), but it is there. I like the Puppet Theater and could play all day, with or without an audience. I let them both loose and quietly watched them play and pick out a toy of their choice. Catherine picked out paper dolls and Carson, a pirate ship (it was between that and a Mr. Snuffleupagus) and I lucked out that neither item was over $15. Carson is quite the expert on animals. He stood for a long time in front of a huge shelf of realistic plastic animals, naming every single one of them. He even informed me that some people call the Manatee a Sea Cow. I then quietly watched him pick up a large Luke Skywalker doll that talked when you pressed his belt. The first thing the doll said was, "My name is Luke Skywalker", to which Carson replied "Duh, everybody knows that" and put him back on the shelf. Fun, fun. This is from Mark & Jen's Newsletter (my friends in Mozambique). As Heidi was finishing her stories, a Brazilian Pastor from one of our bases in the south who is a student in the Missions school interrupted class holding an african boy between the age of 7 & 10 years old. The pastor was holding this limp little body in his arms. 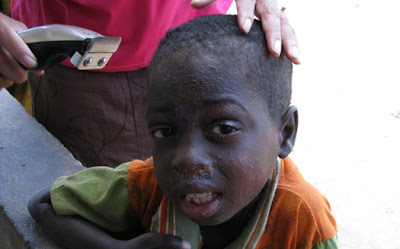 The child had long thin legs and a lot of scabs on his sweet little face. He had a lot of green mucus dripping from his nose, some of which was crusted over because no one had wiped it clean. Pastor Roberto held this child in his arms and said to Heidi “Please, we need to pray for this child now!” She agreed. Heidi stopped her stories and asked for us to gather around the boy to pray. Pastor Roberto calls out to the students, “This is Paulo. He has AIDS. Who here has the faith to pray for his healing? Who has the faith to believe? Then as if someone was bubbling up all this energy inside of me, these words came bursting out of my mouth: “WHAT DO YOU SEE? BEGIN TO SPEAK WHAT YOU WANT SEE IN THIS BOYS LIFE. BEGIN TO SPEAK LIFE OVER HIM AND DECLARE HIS FUTURE INTO EXISTENCE. WHAT DO YOU SEE?” So everyone begins to speak life and words of what the Lord was showing us about his future. “I see you as a healthy boy!” “I see you happy and playing with other kids!” More words, more prayers and again out of my mouth came “WHO DO YOU SEE?” “WHO DO YOU SEE IN HIM?” So the crowd began to speak who this child is in Christ. “He is a son of God” “He is royalty, a prince!” “He has a destiny in God!” “He has a future!” Words of Life. Life. Life. I knew these words were not coming from me, but the Jesus in me. Jesus was calling out for righteousness through me. I was hungry to see righteousness for this little hurting boy. The mood in the room began to change from somberness to one full of faith and hope! WOW...and here it was, not a story in the Bible that took place 2000 years ago, but I and many others were face to face with this reality...what am I going to believe? Who am I going to believe? 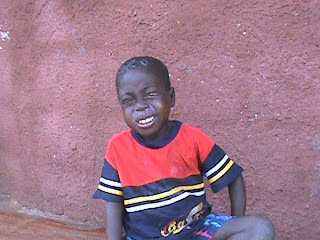 Paulo’s mother had brought little Paulo into our clinic several times for care. When our nurses gave antibiotics for Paulo to take, the mother would take them instead. She seemed to not know how to care for her little one. 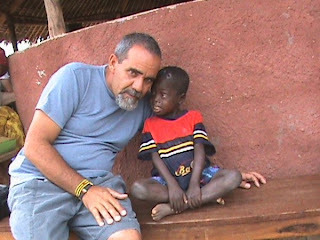 Pastor Roberto and his wife took care of little Paulo for several days after the class. The nurses at the clinic say Paulo was so different! This couple cleaned up his face, cared for his scabs and open sores on his body and loved him as if he was their own. Little Paulo was transformed. Not by medicine, but by love. He was not even recognizable to many after the love and care he received from this pastor and his wife. He was healthier and happier. His countenance had changed completely. His family brought home a different, happier healthier boy. He can make a difference through your little life...and change someone else’s little life, for the Glory of His Name!